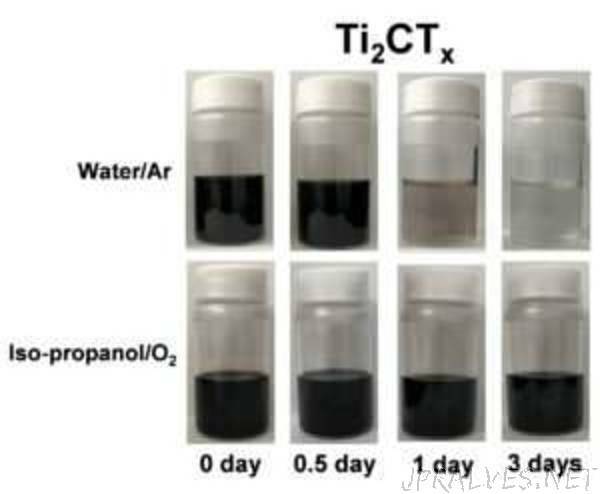 “Researchers at Missouri University of Science and Technology have discovered that 2-D titanium carbide materials, or MXenes, can react with water without the presence of other oxidizers. Their finding may lead to new insights into the unusual chemistry of MXenes and consequently, have impacts on MXenes’ storage and device manufacturing. “Our new findings are important because now we know it is water itself rather than oxygen that MXenes need to be protected from during manufacturing and storage,” says Shuohan Huang, a doctoral student in chemistry at Missouri S&T. Researchers are excited about the potential use of MXenes in energy storage and harvesting applications such as batteries, supercapacitors and triboelectric nanogenerators, which convert wasted frictional energy into electricity, according to Dr. Vadym Mochalin, associate professor of chemistry at Missouri S&T, who is the principal investigator of this project. Mochalin and lead author Huang, who works in Mochalin’s research group at Missouri S&T, discuss their findings in a paper titled “Hydrolysis of 2D Transition Metal Carbides (MXenes) in Colloidal Solutions,” which was published today (January 16, 2019) in the American Chemical Society journal Inorganic Chemistry.